The present study consists in an update of the content of chapter number 3 of our book “Amianto: un genocidio impune” (“Asbestos: an unpunished genocide”), including comments of articles which were published after the book was or even though they did not obey this rule, they were excluded. At the same time, we have also made the text lighter in some digression which were out of the line of argument purpose of the text. A dedication is also added. Irving J. Selikoff, Henri Pezerat, Nancy Tait, Alan Dalton, Luis López Areal del Amo, Ana Cecilia Niño Robles. They all fought against asbestos. With all of them, the author has had the honor of maintaining an epistolary relationship. This review article deals with the epidemiological phenomenon known as “familial mesothelioma”, consisting of mesothelioma involvement of two or more members of the same family. Three types of sources of documentation have been used: medical literature, Spanish court judgments, and news published in the media, including the Internet. As is the case with mesothelioma, in general, for “familial mesothelioma”, there is evidence of a registration deficit, caused, among other factors, by extrajudicial agreements, by the lack, in certain countries – Spain included – of Official and reliable records, etc. It is argued in favor of considering the previous exposure to asbestos as a determinant and main, almost exclusive, factor, regardless of whether the genetic predisposition (suggested by the existence of some – not all – cases of consanguinity), can contribute, in a subsidiary way, to the explanation of the epidemiological phenomenon. The fact that “familial mesothelioma” is the zenith of malignancy, together with cases of simultaneous coexistence of several malignant pathologies – mesothelioma included – in the same patient, with previous exposure to asbestos. Mesothelioma is a malignant tumour that develops from the mesodermal tissue which forms the coelom that shapes the pleura, the peritoneum, the pericardium and the tunica vaginalis. It is a malignant tumour (cancer) induced, overall, by the exposition to asbestos. Asbestos worker’s relatives are included among the cases affected by non-occupational mesothelioma exposition to asbestos. For them, only cohabitation has been the result of such an unhappy end. In industrialized countries, over 20% of diagnosed mesotheliomas correspond to non-occupational exposure: Goldberg & Luce (2009). In these patients, asbestos fibres are also identified in situ: Gibbs et al. (1989), Dawson et al. (1993). In the group of affected people, we have to highlight medical works carried out by wives and widows of these workers because their mention evidences that there is no consanguinity in these cases, so no genetic predisposition is revealed. Therefore, there is no genetic predisposition to undergo mesothelioma. This is an important idea to take into consideration when thinking about the topic that is explained next. Among the widow group that we were mentioning before, it is evident that (at least) an important proportion of them, apart from suffering from mesothelioma, her widow status will occur as a consequence of the spouse death which is also owing to the occupational exposure to asbestos. Sometimes, as we said, their disease will be another mesothelioma. With it, a circumstance which in medical literature is known as “familial mesothelioma” would have happen. This expression is typically used in cases where there is consanguinity, which will lead to think that there is genetic predisposition, which theoretically, could be appropriate, but practically it is only an excuse for the procedural sophistries of responsibility exoneration. For information about the presumed role of genetic predisposition related to asbestos exposure related pathologies, see, for example: Charpin et al. (1981). Genetic predisposition is an important etiologic factor which should not be dismissed in procedural issues. It would not be scientific because it is a hypothesis that shows that only a small minority of the exposed people will develop the disease. However, it is not acceptable that such a natural circumstance and so unconnected with human control is used out of the academic, scientific or medical area but in the judicial area to exonerate another factor that is actually possible to control by humans: asbestos exposure. We know some specific cases of these attempts of a Spanish defendant company plea in which if we read carefully, it is possible to conclude that they are abusing from the available scientific evidence. See: Neri et al. (2005). On the other hand, the most recent study, which is quite exhaustive and well performed, does not give solid and conclusive results which support the idea of a genetic predisposition for malignant mesothelioma: Cadby et al. (2013). In our point of view, it is a very weak statistic evidence. We believe that the authors hoped to find more conclusive results when they designed the study. Ji et al. (2016) concludes that genetic factors may contribute to the familiar clustering of mesothelioma but the contribution of shared environmental factors could not be neglected. De Klerk et al. (2013) did an experiment with more than 11,000 former asbestos workers and residents from Wittenoom have been followed up in cancer and death registries. The results suggest an important, but not large, genetic component in mesothelioma, similar to many other cancers, but disentangling genetic and exposure effects has not been done. The work of Betti et al. (2015) showed that Inherited loss-of-function mutations in the BAP1 oncosuppressor gene are responsible for an inherited syndrome with predisposition to malignant mesothelioma, uveal and keratinocytic melanoma, and other malignancies. In this article, they report the analysis of BAP1 in five multiplex malignant mesothelioma (“familial mesothelioma”) families and in 103 sporadic cases of malignant mesothelioma. Germline mutations that were inherited in an autosomal dominant fashion were identified in nine families with multiplex malignant mesothelioma (which is called “familial mesothelioma”) cases and 25 families with multiple melanoma, renal cell carcinoma, and other tumours. Germline mutations were also identified in sporadic malignant mesothelioma cases, suggesting that germline mutations in BAP1 occur frequently. Interestingly, whereas the three individuals who were possibly exposed to asbestos developed malignant mesothelioma, the individual who was not exposed developed a different tumour type, that is, mucoepidermoid carcinoma. This finding suggests that the type of carcinogen exposure may be important for the cancer type that is developed by mutation carriers. On the contrary, the other families or the 103 sporadic patients did not show germline mutations in BAP1. In our opinion, this results show that not only the exposure to asbestos but also the genetic predisposition are present factors in the appearance of the phenomenon of “familial mesothelioma”. This is the reason why the exposure to asbestos had an etiologic role in all the cases although it was not exclusive. In Bianchi & Bianchi (2013), malignant mesotheliomas of the pleura, epithelial type, were observed in two brothers (“familial mesothelioma” with consanguinity). Both the patients had histories of severe exposure to asbestos, having worked as insulators. The latency periods in the two cases were 26 and 38 years, respectively. Available literature data suggest that mesothelioma occurrence among blood-related people is favoured by a genetic predisposition. In Finkelstein (2013), in the article headed “Pneumoconiosis and malignant mesothelioma in a family operated metal casting business that used industrial talc from New York State”, the author reports a diagnosis of pneumoconiosis and mesothelioma in a husband and wife who operated a small metal casting business that used industrial talc from New York as a parting agent which is known to contain talc intergrown with amphiboles such as tremolite and/or anthophyllite. Therefore, we can see that members of the same family can be affected by asbestos-related pathologies, with no need of consanguinity among the members of the mentioned family. The exposure is enough to explain the observed cluster. “Familial mesothelioma” cases were already reported in the first works related to this neoplasia with asbestos exposure. See: Wagner et al. (1960). In this article, household contamination cases are also mentioned as cases of death from mesothelioma, which exclude any explanation that involves genetic predisposition in the case of domestic servants, wives, shepherds, peasants or officers. To have a more concrete idea of the aspects we want to outline, it is convenient some examples to be mentioned. Risberg et al. (1980) report a Swedish family in which the father, 3 brothers, and a sister all died from mesothelioma. Occupational asbestos exposure in the building industry probably occurred in 4 of the 5 cases. So, in this case we can find occupational and non-occupational exposure, with more cases of the first situation. In Albuquerque de Castro et al. (2007), two familial groups who were related to asbestos textile industry with mesothelioma were presented. In the first one, five workers, four brothers and a cousin. In the second one, two sisters, all of them affected as we already mentioned. The authors report that asbestos presence is always a key factor as the cause in all the cases. In Ascoli et al. (2003), they identified five cases of malignant mesothelioma within one family with exposure to asbestos experienced during childhood, as ‘next door’ residents of a workshop recycling asbestos-contaminated jute sacks in Naples, Italy. This cluster discloses the health risk in the reuse of bags that previously had contained asbestos. See also: Barbieri et al. (2008), (2009), Tomasini et al. (1990), De Zotti & Fiorito (2007) for more information about this way of contamination. The distinction between the malignant mesothelioma and the “benign” mesothelioma is appropriate due to the fact that they are two very different pathologies histologically and in their prognosis -quite somber in the case of the malignant disease- or because of their relationship with asbestos exposition, which is only evident in the case of malignant mesothelioma. However, this is not enough to confirm that a benign mesothelioma can not become malignant: González-Moreno et al. (2002), Klima & Gyorkey (1977), but without evidencing a proved relationship with asbestos. All of this does not prevent medical literature to register cases of benign mesothelioma with asbestos exposure: Dedrick et al. (1985), Goolad & Fletcher (1991). This possible connection is also the hypothesis suggested in Giordano & Nappi (2005). In Koyuncu et al. (1982), the authors reported the case of a six-member family in which three of them were affected of mesothelioma while the other three presented pleural swelling and calcifications. The analyses of the home floor samples and the plaster used in the property boundaries revealed the presence of asbestos fibres, concretely tremolite and chrysotile. Li et al. (1978) reported a case of pleural mesothelioma in the wife and the daughter of an asbestos handler who had been working as a pipe insulator at a shipyard for 25 years and also developed asbestosis and lung cancer. Both the wife and the daughter had not had any other contact with asbestos but the one provided by the working clothes, contaminated because of the labour use. A very similar case was described in Schneider et al. (1995) where three members of a family out of four died from asbestos-related diseases. Only the husband had a labour direct exposure because of the manipulation of material elaborated with blue asbestos while he was working in a producing insulating factory between 1950 and 1959. He died from pulmonary asbestosis. His wife and one son died from mesothelioma. The laundering of her husband’s clothes was revelled as the origin of the disease. His son was exposed during his childhood helping his mother with the laundry. In addition, he visited his father’s working place regularly. In Langhoff et al. (2014), in the article titles “Almost half of women with malignant mesothelioma were exposed to asbestos at home through their husbands or sons” the authors present this statement as a result of a study based on their cohort made from mesothelioma cases which appeared in women from the north of Jutland diagnosed between 1996 and 2012. We would like to express our conviction that this proportion (46%) may be higher where socio-economic conditions allow women salaried work out of the house to be less prominent. In Mensi et al. (2015), in the article titled “Impact of an asbestos cement factory on mesothelioma incidence: Global assessment of effects of occupational, familial, and environmental exposure” the authors concluded that related to the familial one, a higher exposure was in women in relative and absolute terms. The observed latency was between 12 and 76 years (median: 54). In Musti et al. (2002), a family of three sisters affected by mesothelioma is described (2 pleural and 1 peritoneal) and one brother affected by pleural plaques. All members of the family had been subjected to previous asbestos exposure of environmental-residential type. For 13 years, from 1951 to 1964, their housing was provided by the father’s employer, an asbestos cement factory, and the factory warehouse was on the ground floor of the building they lived in. Otte et al. (1990) reports the case of a family where the father, the mother and the son died from mesothelioma. Of course, consanguinity was only present between parents and son but not between spouses. This fact revels that the crucial factor is asbestos and not the already mentioned consanguinity. From 1944 to 1961 the family produced a material that was used to fix screws in drilled holes and consisted of amosite, gypsum, and sand. This was produced in the basement of their villa and was described as being a dusty job. This case shows clearly that it is asbestos exposure that determines the appearance of “familial mesothelioma” and not the consanguinity. Using Occam’s razor, the economical or calmness principle, the invocation of asbestos as an efficient cause turns out to be the simplest hypothesis and it is always compatible with the contrasted facts. So, it evidences a good performance of the scientific method and is the one which should be retain as truthful because is the most precise and the one with less contradictions. Studies which try to establish a link between some histocompatibility antigens (HLA) and a genetic predisposition to suffer from mesothelioma with asbestos or erionite (fibrous zeolite) exposure, present results which we categorise as weak: Karakoca et al. (1998), Wagner et al. (1983). However, this is not enough to dismiss the genetic predisposing factor, at least in some cases. It is important to mention that asbestos exposition is present in epidemiologic studies but also in experimental ones related to a genetic factor in the mesothelioma’s etiology. All of these is not an obstacle to find works such as the one of Muñoz et al. (1988) in the medical literature, where the authors report a case of three brothers affected by mesothelioma with no exposure to asbestos. However, we can not avoid the existing evidence of the lack of reliability referring to if there is exposition or there is not, at least in the work done in Mexico. Moreover, we can not avoid the fact that in the mentioned country there are outcrops of geological erionite deposits which it is known that is an etiological cause of mesothelioma. Picklesimer et al. (2005) report a familial mesothelioma case diagnosed in a brother and his sister, both with no more exposition to asbestos than the general population which is equivalent to say – as the authors themselves used- that there was not a known exposure. This is an issue that only a post mortem examination could explain. However, we must add that according to Azuma et al. (2009), the already mentioned background exposition would be enough to be the origin of non-occupational mesotheliomas according to the available evidence in each of these supposedly non-occupational cases. The arguments employed by Saracci & Simonato (2001), whose reading would be pleasant, are quite convincing. It is a replica work where the authors debate about the conclusions obtained by Carbone & Testa (2001), who advocate the existence of a genetic predisposition factor in the cases of familial mesothelioma in a special contamination environment: in Capadocia where 50% of the general population death correspond to mesothelioma: Baris et al. (1978). Familial affectation because of asbestos can also be determined by a natural origin exposure, environmental and not industrial: Larrouy et al. (1990). Taking into consideration asbestos exposure, it is appropriate to consider it as the main factor, although it is not exclusive. Moreover, this factor can not be taken as an option which depends on “all or nothing” because, in this case, we would find a big variability in the age of the first exposure, in its duration, in its intensity, in its maximum intensity “peaks” and at the same time a great uncertainty if we want to quantify these values. This is why, a statistical analysis of all these factors will be refutable. However, to see a statistical approach see: Ugolini et al. (2008). Expressing our opinion, we are agreeing with Alderson (1986) when the author suggests that asbestos exposure is an explanation which is enough to explain the clustering of familial cases. It is possible to find the same arguments in Li et al. (1978) & (1989), which is deducible from the title itself. We have to say that according to our knowledge, in relation to asbestos-related pathologies in general and to mesothelioma in particular, it does not exist a comparative study with in identical twins with or without asbestos exposure in each of the individuals and contrasted with an enough latency period. Probably, there has been no chance to do it. Has it been tried? …We do not know. In the medical literature, the closest article which is possible to find is the work by Charpin et al. (1981), where two twin cases are presented. Each of the siblings presents a pathology which is related to exposure to asbestos (different in each pair) and none of them is mesothelioma. It is not an epidemiological study, neither with a control group nor with a wide cohort which would validate the results statistically. On the other hand, this is an impossible experiment to carry out because the proportion of identical twins is very low and it would be necessary to add the asbestos exposure condition. Krousel et al. (1986) report a case of pleural mesothelioma developed in at least three members of a family of first-degree relatives. Only one member had probable direct asbestos exposure. Hax (2003) shows a case of three brothers who had worked in the Baltimore shipyards, so they had a high probability of having been exposed to asbestos. Two of the brothers died from mesothelioma and the third one, who died from asbestosis, presented a nodule in the lung which was detected at the moment of elaboration of the present study. Lynch et al. (1985) reported a study of two brothers, who had died from mesothelioma, and with a long occupational exposure to asbestos and had a similar histological pleural mesothelioma. Wilkins et al. (2007) reports two cases of mesothelioma in first degree relatives arising within weeks of each other. The patients had a shared exposure to asbestos. In Nalepa & Zieliński (2001), the authors report the case of two brothers who developed mesothelioma and whose contact with asbestos happened during childhood (asbestos blanket). Even though it is an exceptional case, we can see that familial mesothelioma has also affected users of products elaborated with asbestos. Without a previous known exposition, Milne (1976) reports the case of two brothers with mesothelioma. However, it also reports that end occupations were misleading in 66% of cases regarding the true risk of occupational exposure and at the same time, we can not avoid the fact that the country which the study referred to, Australia, has been one of the most contaminated by asbestos either occupational but also environmental, from the mine or factories neighbourhood, uncontrolled unloading, etc. «VECINDADES PELIGROSAS. Amianto y riesgo residencial» (HAZARDOUS NEIGHBORHOODS. Asbestos and residential risk) ( http://www.rebelion.org/noticia.php?id=195186 ). Martensson et al. (1984) observed mesothelioma in two pairs of siblings. In the first one, a sister and a young brother suffered from asbestos exposure during their childhood at home. In the second case, two twin brothers had been exposed occupationally to asbestos for eight years. In the title of the work, the authors interview and in the text they confirm that the incidence of mesothelioma in this two pairs of siblings demonstrate the concurrence of a predisposition genetic factor. However, taking into account that exposition to asbestos occurred in all the cases, it is necessary to wonder if the calmness principle, economy of hypothesis or Occam’s razor should be decisive to consider that this exposure alone would be enough to give an explanation to the situation. Hammar et al. (1989) reported a case of three brothers who worked in the insulation industry and developed mesothelioma. In the second family, the father, who was occupationally exposed to asbestos, died from a peritoneal mesothelioma. Eleven years before his son died from an identical histologic type of peritoneal mesothelioma. The fact that malignant mesothelioma is associated with asbestos, yet its occurrence in genetically-related individuals suggests a role of host predisposition in three women and their cousin was evidenced in the work of Ascoli et al. (1998). The women had worked in the same confectionery shop as pastry cooks and/or pastry shop assistants; the use of an asbestos-insulated oven was the putative source of exposure. The man had occupational exposure as a heating system installation worker. We believe that it is appropriate to add that if the worker was close to the other relatives wearing his working clothes it is not necessary to use the confectionery shop oven to explain the asbestos contamination and the resulting mesothelioma. Other cancers were reported in other relatives: larynx in the brother; pleura and lung in the mother; lung in aunt, uncle and also in a cousin. In our opinion, regarding at the localization, all of them are compatible with an etiology by asbestos. Hiyama et al. (1998) report two cases of diffuse malignant pleural mesothelioma occurring almost simultaneously in one family. Patient 1 was a 42-year-old Japanese man who had worked as an electrical engineer for 25 years. Patient 2, his mother, was 69 years old. She lived for 10 years with patient 1 after he started his work, and also worked at a shipyard herself for 6 years. The first patient had had an occupational asbestos exposure while working with isolations and electricity wires. Time ago, the mother had worked for four years in a shipyard and in a steel plant for 2 years. Therefore, occupational exposure to asbestos was confirmed in both cases. Bianchi et al. (1993) reports familial mesotheliomas in four pairs of patients. The group includes six men and two women, aged between 44 and 84 years. A blood relation (father-son) existed in two pairs only. One more time, genetic predisposition trough consanguinity occurs to be illogical according to the provided evidence. On the contrary, all the patients had previous exposure to asbestos; in five of the cases it occurred in the shipyards. In a review -Ascoli et al. (2007) – the authors study eleven family clusters (22 cases of mesothelioma) which were identified revising the register of mesothelioma in Italy, and 51 clusters (120 cases) that were extracted from the revision of 33 previous studies. The authors conclude that the pattern of consanguineous cases is the same as the non-consanguineous (the male prevalence and pleural affectation, age of diagnosis, older than 50 years and asbestos exposure). Most affected familial clusters occurred in asbestos workers (shipyards, asbestos-cement production/processing, and insulation) and household-exposed blood relative. Others were related to asbestos-cement factory pollution, asbestos-in-place, and handling asbestos-contaminated textiles. Two clusters were without any known exposure. Cancer family history revealed lung cancer cases in eight clusters. The authors support that available data support asbestos exposure as the main risk factor in mesothelioma cases among blood relatives. Our finding of a low proportion of familial cases would not suggest the influence of a large genetic component for mesothelioma in blood relatives for familial mesotheliomas. In Bianchi & Bianchi (2012), the authors show that “Four mesothelioma patients had a blood relative with the same tumour”, in a cohort formed by ex-workers of Monfalcone (Italy) shipyards. 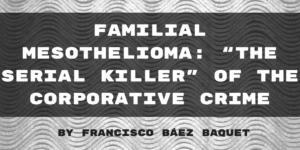 Generally, and not only referring to “familial mesothelioma”, a genetic predisposition turns out to be the favourite explanation in an expert knowledge for pathologies with an occupational exposure: Menéndez Navarro (2003). Following our review of the treatment of “familial mesothelioma” in medical literature we have to say that in Dawson et al. (1992), in a work titled: “Familial mesothelioma. Details of 17 cases with histopathologic findings and mineral analysis”, Nine new cases of mesothelioma clustering in four families are described, and additional information is provided on four previously reported families. Diagnoses were confirmed histologically and the mineral fibres burden was quantified by transmission electron microscopic examination and energy-dispersive x-ray analysis, and this confirmed significant exposure to amphibole asbestos in all patients. All these cases, where some families have been reached by the lethal mesothelioma, represent a peak in the magnitude that is caused by asbestos exposure, a real nightmare which, in the family environment, recalls the plot of a fiction literature created by Agatha Christie in the black novel “Ten Little Niggers” and this is why “familial mesothelioma”, all together with asbestos-related promorbility, both of them turn out to be the non plus ultra of its poisonous behaviour. It is important to highlight this fact in order to value it suitably when analysing the need of banning all type of asbestos worldwide. For more information, see the content of our work: “Relación «causa-efecto», entre amianto blanco y mesotelioma (I) y (II)” (http://www.rebelion.org/noticia.php?id=197680 http://www.rebelion.org/noticia.php?id=197701 ). (Cause-effect relationship between white asbestos and mesothelioma). This aspect, the familial and continuous drama which represents is not found in our bibliography about “familial mesothelioma”, although it is very evident. According to our personal criteria, the objective scientific necessity must not treat human beings as objects. If we look at the sensitivity and looking at the aspects which are not exteriorized, the reviewed authors will be more similar to Menguele, not to Ramazzini. Kalogeraki et al. (2013) shows a study where a family in which the father with prolonged occupational asbestos exposure developed malignant pleural mesothelioma and his daughter developed the same disorder 14 years later. This familial misfortune is remarkable when one of the affected people was an under-aged when she was exposed. Maltoni et al. (1990) report a case of a worker and his daughter who both died from mesothelioma. He had been working as an engine driver for the state railway in Boulogne (Italy), so he had been exposed to asbestos from 1954 to 1967. The railway transports sector is a classic among the Jobs related to asbestos. He died from pleural mesothelioma in 1982. His daughter, who was born in 1944, started to feel symptoms in 1988 with caught fit and right pleural haemorrhage in the thorax. The biopsy histological examination showed fibrous tissues with a solid carcinoma infiltration and a mesothelioma. She died nine months after the first symptoms. The obtained samples of the pleural neoplasia from the subpleural lung parenchyma with the pleura and the pulmonary parenchyma without pleura, showed that all of the samples contained chrysotile asbestos fibres. The concentrations were 200, 2300 and 500 fibres per milligram of dry tissue. Out of the scientific bibliography about this topic, the first chapter of the book by Giampiero Rossi “La lana della salamandra” tells the terrifying story of the Romana Blasotti Pavesi family who are the presidents of the “Associazione Famigliari Vittime Amianto” from Casale Monferrato (Italy) where the factory Eternit settled down. Romana lost her husband, Mario Pavesi wcho died from mesothelioma at the age of 61. His daughter Maria Rosa also died from mesothelioma at the age of 50. His sister died from mesothelioma who was 59. His nephew and son of the mentioned sister died from mesothelioma at the age of 50. His cousin also died from mesothelioma. Even though Romana, who is quite old right now, would end dying from mesothelioma (which can not be discarded), consanguinity could be mentioned as a co-factor. We do not want to close this story without inviting the reader to think about Romana’s family daily life because of the “salamander wool”, because of asbestos. Ben Hills, in his work “Blue Murder” tells the terrible story of Mrs. Val Doyle, who died from mesothelioma because of asbestos from the Australian mine of Wittenoom on the 4th of February 1989, at the age of 49, after experiencing the death of her relatives from the same reason, because of the same contaminating: her parents -Philip and Esther-, her husband -Ron Doyle-…, until a total of five members of the same family, who ended up being six, Val Doyle included. We can find a similar case in the Nancy Frías family, who also suffered from the death of five members because of asbestos. Her father, Gilberto Frías, ex-worker of the company “Pizarreño”, her brother Orlando, and three brothers-in-law who did not work in the company but lived near them, all of them died from pleural mesothelioma. As we can see, the family cluster only presupposed consanguinity in a part of the affected people. Frías home is only 20 metres away from the asbestos-cement factory in Villa Pizarreño, a residential area which was built for the workers of the company and their relatives in the 1950s. (Source: “LA CUARTA:El Diario Popular”, 6/11/2011). “Watching the way people die, watching how they become unrecognizable, the suffering, the pain…Only six months with pain and it is over”, told Nancy, who had the purpose of starting judicial actions against the Government and against a mutuality, together with other families affected from similar situations. “When they die, a 50-year-old person seems to be 80. There are people who have lived here and have moved to another place and after, they die. We need to be conscious. I do not want to do the tests in order not to discover that I have this terrible disease. We feel grief, helplessness when we realise that in this industry does not care about its workers and the people around them”. Through her words, we can guess the heart-breaking human drama which these people have to suffer and some of them have never worked with asbestos. Ramón Becerra, a patient from asbestosis, has to suffer from a painful experience of watching his three children die from mesothelioma: Fernando at the age of 45, Monica, at the age of 35 and Juan Carlos at the age of 27. All of them died the same year, in 1998. For 12 years, they had been living in a town which was near a factory from the company “Sociedad Industrializada Pizarreno S.A.”, which belongs to the firm “John Mansville”. In this factory, Ramón Becerra worked as a lathe operator. None of the children had worked with asbestos. Their contamination was environmental or household. After the death of his son Fermando, Mr. Becerra and other workers of the company, founded the «Asbestos victim’s committee». See: Claudia Morales (2006). This shareholding company revels the rank cartelization of the industrial sector of asbestos worldwide. In 2004, several media published the story of Bárbara Fitt, a woman who was diagnosed from mesothelioma and whose husband and daughter had died because of the same disease which origin was asbestos exposure. Mr John Fitt, who died at the age of 67, got the disease from occupational exposure, while the wife, Bárbara, and the daughter, Evelyn, were affected by household exposure probably throughout washing the father’s work clothes. Evelyn died at the age of 45. Barbara did it at the age of 71. They were from Camberley, Surrey, a shire in the southwest of England, United Kingdom. A brief review like this one can not show what the emergence of this disease is erased from a human life: the private surrounding of hobbies, broken plans, torn fondness, vanished presences, missing memories. A genetic predisposition may be found between the daughter and one of her parents, buy logically, it can not be found between the espouses. At the same time, their other daughter Yvonne, who has worked as a controller in the same company, was warned that she could also undergo the disease. The “Harry and Stephen Gray Mesothelioma Snowdrop Memorial Found”, has got its origin in two people who died from mesothelioma. Harry Gray, at the age of 67 and his son Stephen at the age of 45. Both of them died because of occupational exposure to asbestos. Brian Kember’s death from mesothelioma, which was diagnosed in 2001, and his father’s death, both of them originated by the pollution generated in the crocidolite mine in Witternoom, Australia may be found in the origin of the book “Lean on Me”, which was written by his wife Lorriane Kember. Giovanni Spadanuda was one of the Italian immigrants who started working in James Hardie company. His relationship with asbestos was determining to develop mesothelioma, which caused his dead, years later. His son Frank Spadaunuda, who played with what he thought was a strange kind of sand during his childhood but in reality it was asbestos remains, developed another mesothelioma some years later when he was married and had children. All the elements of “familial mesothelioma” are present in this story: consanguinity, the father’s occupational exposure and the son’s environmental household exposure. If Frank had been an adopted son, would these events have been different? We doubt it. John Towesey, from Hextable, in Kent, England, was diagnosed from mesothelioma at the age of 59 together with his mother Lilly, who was a terminal patient with the same condition. His work with asbestos as a carpenter brought his mother and him to this end. She suffered from it washing her son’s clothes. Hudak & Hagan (2012) report the case of Deborah Hammond, who died from mesothelioma, just as her aunt Ruth Forrider did. Deborah’s father and Ruth’s husband worked as railway techniques in the shire of Lorian with asbestos dust presence in its carriages. June Hancock, from Armley in the southwest of Leeds, West Yorkshirem England, died from mesothelioma in 1997. His complaint against the asbestos factory “Roberts JW” and against its owners, “Turner & Newall” was innovative because she was the first one complaining about mesothelioma who had not been exposed to asbestos in the working place: since she was a child in the surroundings of the factory in the 1930s, she played with other children throwing “snowballs” made of asbestos and he also played in the pavement which were covered with dust of blue asbestos. Her mother, Maie, had died from mesothelioma in 1983. When she decided to sue, she did it for herself, but also for her death mother and for the rest of residents. The favourable sentence which was reached in 1995, helped other people in similar circumstances to reach justice. Her story has been brought to theatre in a play by Ken Yates titled “Dust” in performances played in Armley in February and March 2009. The cast was made of Armley residents who had seen the devastation that asbestos had caused in their community. The show did a tour around London and Glasgow. The “Warner Brothers” was interested in making a movie. Nowadays, in the town of Armley, new cases of mesothelioma are still appearing as the result of the exposure to asbestos dust from the factory “Roberts JW”, so Jane Hancock memory is still present. Her example and witness brought to the creation of the found “June Hancock Mesothelioma Research Fund”. María Andera’s family, who lived in Seattle and Tacona, Washington, was another woman affected from “familial mesothelioma”; because of this reason, he lost her brother and husband in a period of two years. Again, this case shows that family and cohabitation bonds, without taking consanguinity into consideration, do not protect from this affectation when we find this circumstance. The important factor is household or occupational exposure to asbestos: either María’s husband, Richard Andera, but also her brother, Robert Gesinger, had worked in producing and repairing boilers, in shipyards of Bremerton, Washington. Richard Andera died on the 10th of May 1995 and Robert Gesinger died on the 11th of June 1997. Now, let’s take into consideration the case of Robert Kinsman, who was affected from mesothelioma, and his relatives, who were affected from the same disease. Apart from his father and two uncles, Bob Kinsman great uncle, several of his cousins and Robert himself, worked as isolators. For years they worked surrounded by asbestos in places such as schools, shipyards and planes producing plants. They were in small dusty rooms in the area of Seattle-Tacoma. They were never warned about the danger. A pleural haemorrhage warned about their affectation by mesothelioma, the same disease his father and uncles had died from. Another case to take into consideration is Lesley Shirley’s, who died at home in Master Lane, Halifax from malignant mesothelioma at the age of 57 on the 7th of April 2010 and whose cancer was diagnosed in 2007. Her older brother, who had moved to the United States, had died from the same disease at the age of 47. Mrs Shirley, who job had been working with retired people, had never been occupationally exposed to asbestos. However, her brothers and parents had when they worked as spinners in a textile factory between 1959 and 1960 in Acre Mill. Moreover, when the two brothers were children, they had been exposed to asbestos in the canteen of the factory during Christmas celebrations and Mrs Shirley remembered how she picked blueberries and blackberries which were covered with white dust in a wasteland near the factory as a child. As there was a clear origin of the contamination, judge Roger Whittaker ruled a death verdict due to occupational disease for Lesley’s death. Next, we report the case of Rubén Arnold (father) and Daniel Arnold (son), who died from mesothelioma. The father, Rubén, had worked in a shipyard from the company “Lockeed”, where he was occupationally exposed to asbestos; his son, Daniel, was also exposed to it but only through his father working clothes, which were contaminated by the mineral fibres and were brought home. Rubén died in March 2008, while his son, who was also affected from mesothelioma, died at the end of 2010. The court of appeals sentenced in favour of “Lockheed” at the beginning of 2011: unpunished genocide. Another case of familial mesothelioma because of asbestos exposition is the one which happened in Colombia. On the one hand, it affected Rafael Mayorga, a worker in the company Eternit, who brought home working clothes contaminated with asbestos. On the other hand, it affected his son Luis Alfonso Mayorga, who was a system engineer who had never worked with the mineral, but during his childhood he was exposed to asbestos because the situation mentioned before. He was affected at the age of 45. His misfortune was reflected in several media of the country. The fact that the characteristic familial is not unique of mesothelioma, but it is also applicable to other asbestos-related pathologies is shown in Orn et al. (1991), an article which describes the case histories of four individuals in the same family, all of whom developed asbestos-related disease. One of the cases is a woman, who after seemingly minimal exposure to asbestos, in the form of cleaning her husband’s working clothes, developed a mesothelioma. See: Engelfriet (1964). “Washing the working clothes is a necessary activity for the production objective looked for the employer. The fact of not doing this task would suppose an evident lack of hygiene for the worker but also for the people living with him, both at home and also at work, where it would end up with a negative effect in the task which gives meaning to the worker’s task. The frequency of washing these clothes would allow to restore normality in a situation of dirt, including asbestos, whose accumulative effect would end up supposing an obstacle for the production if this periodic normalisation does not occur. When the employer avoided the negative consequences which come from its Factory working conditions, delegated its periodic remedy to the worker himself and indirectly brought to its worker’s home the solution of the created problem, he was proceeding de facto the same as if he had hired people who were suffering from household exposition because of asbestos to clean the working clothes. In the salary which was contributed by the worker for the inhabitant’s substance -especially in the case of the wife- it was included the indirect compensation of this task for the normal development of the productive process. This was the situation of Cupido Adams, who worked in a south African mine in Priesca. As the result of this work, he suffered from asbestosis and he saw his wife, parents and brothers dying from the same reason. Once again, in the case the wife, genetic predisposition is not acceptable. The same happens in the case of the parents because of the same reason. One or the other could have it, but not both. When a whole family dies because of a carbon monoxide escape or having eaten mushrooms which they thought to be edible, nobody dares give a plausible explanation looking at any co-factor related to genetic predisposition. On the other hand, it was never positively identified for asbestos. The objection is not in the scientific use of the genetically conditioned susceptibility, but in using this hypothesis to give the victim the responsibility of the affectation. We can find a case which is similar to the previous one and is also told by Ben Hills in his book “Blue Murder”. It is the case of Eric Mercer, who suffered from asbestosis and his older brother Ray. Both of them died from the same occupational disease and all of them acquired it by working in the Australian mine of Wittenoom. Additionally, we report the case of Xavier Jonckheere, who founded ABEVA which is an association dedicated to the protection of asbestos victims and their families in Belgium. His father, Pierre, who was an engineer in the multinational Eternit in its factory in Kappelle-op-den-Bos, died from mesothelioma in 1987 at the age of 59. Her mother, Francoise, died in 2000 when she was 63 with the same diagnosis. One brother, Pierre-Paul, who was father of three children, died from mesothelioma in 2003 at the age of 43 because of the same contaminating. Another brother, Stéphane, also died from mesothelioma at the age of 44 in 2007. From a total of 7 members of the family (the mother, the father and 5 brothers, including Eric), 4 died and 3 survived, among this last group we can find Xavier. However, it has been contrasted that in the lungs 4 of 4 of them the levels of asbestos were much higher than the average of the population and 2 of them had pleural plaques, one of them was Eric himself. It is evident that the non-metaphoric Democles sword hangs from the heads of the survivors of this tormented family. On the 28th of November 2011, Belgian justice sentenced the society “Eternity” to indemnify the family of an asbestos environmental victim by paying 250,000 euros because of the death from mesothelioma of François Van Beek Noor, who was Pierre Jonckkheere’s wife, and lived in Kappelle-op-den-Bos, whose death occurred in 2000, as we mentioned before. It took eleven years to admit the damage they caused! However, the story does not finish here because the multinational announced its intention to appeal the sentence. Eternit declares that asbestos dangers were not clearly determined and no offence could be reproached to the company. See: Nay (2003), Waterman (2011). These arguments were rejected by Brussel’s court of first instance who considered that the risks that asbestos can cause pleural cancer are known at least since 1967, Eternit also knew or should have known, but it didn’t take it into consideration according to the judge. It is even worse because the company has tried to hid the dangers, according to the sentence. “It is demonstrated enough that Eternit had personal interest in the way it has tried to minimize and hide the asbestos dangers and actually, fight legal initiatives to public health protection”. The court took also into account “the incredible cynicism with which scientific knowledge have been omitted because of the desire of profit”. It is expressions like this one that do not appear in the majority of Spanish sentences about asbestos when there have been enough reasons for it in more than one occasion. The final conclusion of a judicial sentence is its most important part but the reasoning which leads to it is not less important when evaluating its social influence. Bill Ravanesi, in his work: “Breath Taken: The Landscape and Biography of Asbestos” tells the story of Richard Pankowski, who died from mesothelioma, and his family, his father, who worked with asbestos for 30 years in a factory, died from asbestosis. His mother also died from the same disease, Caril Pankowski, who suffered it because of household exposition. The same happened with Richard himself, who suffered from the same time of contamination since his childhood. In the families in which asbestos related pathologies have determined several deaths, no predisposition genetic factor can be adduced, although it could be claimed for one of these illneses, but not for more than one: it is a too improbable hypothesis to take it into consideration before the most obvious and simple which is asbestos exposure, which caused the several pathologies-mesothelioma and asbestosis, in the familial case mentioned here-. Kazan-Allen (2003) explains the situation of the spouses Frank and Martha Fracalanza. One Frank’s brother had died from lung cancer ten years ago. At this moment, Frank was diagnosed from pleural swelling and pleural plaques. His state got worse, producing asbestosis. Martha, who was also diagnosed from pleural swelling previously, also suffered from asbestosis. All of them acquired their illnesses as a consequence of working with asbestos in its use as an isolator. Between spouses, genetic predisposition is not adducible. However, occupational exposure of the three of them is enough to explain their affectation. Similar reasons can explain Owen Lilly’s case, who died from asbestosis, and his wife, Margaret Lilly who had pleural plaques. The same author mentioned before, Laurie Kazan-Allen, in her renamed work titled “The Asbestos War” (2003), explains the case of John Tood, who was diagnosed from asbestosis, and his family in which all the affected members was because of occupational exposure: his father, his two uncles and a cousin had worked with him in the shipyard of Clydebank, died from diseases caused by an occupation exposure to asbestos. See also: Tweedale & McCulloch (2011). The British House of Commons has got a subcommittee for asbestos, who normally celebrates an annual seminar about this topic (comparisons are always hateful). In the seminar of 2005, which was celebrated in Westminster, Colin Laidler participated as an orator, whose father Ronald died from mesothelioma on the 26th of September 2002. Colin and his brother Roland were the third generation who worked for “Turner & Newall”, the asbestos multinational. The price they paid by the family for those years of faithful service was terrible: Grandfather Laidler died from asbestosis, grandmother Laidler died from lung cancer, father Ronald Laidler died from mesothelioma and his widow and one of the sons have pleural plaques without discarding the appearance of other serious pathologies due to the long latency period that asbestos exposure related neoplasia assumes, especially when we are referring to mesothelioma. To see more about affectation by pleural plaques in asbestos worker’s relatives: Braaker et al. (1983). In our opinion it is important to mention the general absence of investigation among the relatives of asbestos workers for asbestos-related pathologies, the most extended ones are the pleural plaques. Contamination by tremolite, which can be found as a natural compound in the vermiculite, which is extracted from the mine of Libby, Montana, provides large cases of familial clustering in the affectation by several asbestos related pathologies, either the classical ones -mesothelioma, lung cancer and asbestosis- but also the ones that are “forgotten” such as autoimmunity diseases. The dust which is in suspension in the dry mill of the mine had a tremolite asbestos concentration of 40%, even though the extraction was done to sell the vermiculite. Among this category of familial clustering, in the first time we will mention the case of Gayla Benefield’s family, who was the main activist, with Les Skramstad, in the defence of the victims from this already mentioned north American town and its geographical environment. Gayla has lost her parents, Perley and Margaret Vatland, both of them got the disease from the tremolite. First, her mother father, an ex-miner and then, her mother dies from asbestosis. In 1996, when she died, her lung capacity was equivalent to a new born. Nowadays, either Gayla and her husband and her old daughter have been diagnosed from lung anomalies. Moreover, taking into consideration all the relatives a total of…37 people! were found and presented signs of the disease. What is the explanatory value can be attributed to genetic predisposition and consanguinity to explain this amazing cluster?… What dialectic contortions are needed to make this hypothesis admissible?… What “argumentative Kama Sutra” is appropriate to use?… How many relatives of these 37 belong to this familial cluster because of marriage, so with no consanguinity relation with the exception of their descendants? Regarding at Les Skramtadt, who had started his as a sweeper in the mine in the dry grind, had worked in the company only for three years, who had been diagnosed from asbestosis in 1996 and died from mesothelioma and from stomach metastasis on the 21th of January 2007. His case can be briefly summarized with his own words: “When I realised that it was not only me who was ill, but also my wife and my three children, I reached became really depressed”. His wife, Norita and his three children suffer from asbestosis, including her daughter Sloan. Around the neighbour shire of Lincoln there are a lot of families destroyed by asbestos but probably, none of them has paid a higher price than the Bundrock family: six out of seven members of the family were diagnosed from asbestos related diseases: Arthur, Helen, Donna, Robin, Mary and Bill. Arthur Bundrock worked in the mine for 19 years. After 21 suffering, he died from the pollution. In the list of the death because of Libby’s tremolite, there are a lot of coincidences in one surname. Regarding only at mesothelioma, we will take into consideration the affectation in the spouses (so, without taking consanguinity into consideration), in the case of Ann Macpherson and her husband Dereck Macpherson, who died in 1995. Derek had worked in an aluminium processing plant near Banbury in Oxfordshire, England. Mrs. Macpherson, who was contaminated by the inhalation of asbestos particles from her husband’s working clothes, got a compensation of one hundred and ten thousand pounds. For information about asbestos contamination of women see: “Amianto y género” ( http://www.rebelion.org/noticia.php?id=196300 ) – “Asbestos and gender”-. There is one aspect that must be clearly understood: all the case which are told here are just the top of the iceberg because they only reflect those situations which have been told in the scientific literature or in the media, including the Internet normally because of the action of complaining and victims’ associations consciousness-raising. Obviously. They are not the total of the situations which really happened, but those ones which knowledge has been done public because of judicial complaints or any other reason. Glaringly, we miss cases which are referred to Spain, where it is known that some cases exist but we did not obtain the conformation to publish names and circumstances. Their anonymous inclusion is an exceptional resource which we have already mentioned for some cases out of Spain. They have some objective circumstances which make it more justifiable the anonymous resourced which was given for the use of fiction nouns and other “camouflage” precautions. We are not going to lavish any more in order to avoid any loss of credibility from the reader. As an exception of the absence of a register of “familial mesothelioma” cases in Spain, we can indicate that in Rodríguez et al. (2002)-page 39-, they report a case in Asturias: two brothers affected from “internal anaconda”; mesothelioma. – The measurement of the tumour thickness in the images of computed tomography is the current standard in the evaluation of the tumour response to the malignant pleural mesothelioma therapy: Armato et al. (2013), (2014) & (2015), Gill et al. (2016), Labby et al. (2013 -2 ref.-), Mollberg et al. (2012), Rusch et al. (2016), Sensakovic et al. (2011)-. In the sentence STSJ MAD 11432/1998, it is mentioned the death from mesothelioma of José and Arturo (father and son: “familial mesothelioma”). Both cases happened the same day, on the 10th of September 1996. Both of them had been diagnosed from asbestosis previously and had worked in the working centre of Villaverde, which belongs to the company “Ateinsa” and after to the company “Gec Alsthom Transporte S.A.”; The fact that mosothelioma kills two members of a family on the same day is an unlucky fact that shows asbestos deadliness, this time installing RENFE cars from the 8000 series: crocidolite. None of the companies wrote down in the RERA. The already mentioned judicial resolution was solved by dismissing the petition appeal which was brought by the relatives. Familial affectation by asbestos exposure also reaches the users of the products that contain it: this is the case of Mrs. Raven Thundersky, whose parents, three brothers, and Rita Swain, the sister on her mother’s side, died from asbestosis and cancer because of having had their house isolated with a product called “Zonolite” (vermiculite contaminated with tremolite, extracted from Libby’s mine, Montana). Mrs. Thundersky herself, a survival, is also affected; in total, seven people affected, six of them died. This building is placed in the Poplar River biological reserve in Winnipeg, Manitoba (Canada). See: Kazan-Allen (2008). In the 1970s, the United States started prohibiting the pulverisation of the buildings with products which contain asbestos. As most of the fireproof products contained it, the producers decided to stop producing them to avoid judicial complaints. However, WR Grace & Co., continued producing and selling the aerosol “Monokote” saying that according to the law, pure substances do not exist, they admitted up to 1% of asbestos contamination. The real situation was that, according to the estimations after the EPA’s one, vermiculite contamination by natural doping with tremolite, was very low and up to 26%, according to the analysed manufacture sets. This real situation came with a publicity campaign by WR Grace & Co., based on the statement that “Monokote” was a “completely free” asbestos product. As a consequence, firstly, the sprays changed their heavy uncomfortable big masks for simple paper masks, which were completely inappropriate, and secondly, the installation of buildings completely sprayed with the contaminated vermiculite was explosively expanded in a market with a lack of computers because of the new law. The health consequences for workers and consumer are easily guessed. For importation about the simple affectation by exposition originated by the household use of asbestos manufactured products see, for example: Konetzke et al. (1990). Now, we are going to look at other stories which are similar to the previous ones but which have to be introduced in an unusual way: the true names of the victims must be hid under fake identities for reasons that are explained next. They are affected people or their relatives who have accepted extra-judicial agreements with their employers, unfair contracts which include confidentiality agreements. If they were revealed, they would suppose the immediate cancellation of periodic payments which suppose a compensation agreement, which includes medical assistance in private hospitals, under a hard control to the service of these worker’s interests. The finality of this is to avoid their data to be revealed to the public. In the cases of affectation by mesothelioma, due to the brevity of the time between the confirmed diagnose and the death, and at the same time, due to the usual slowness of the justice when establishing the final verdict, all these circumstances configure an objective element of blackmailing and pressure which companies use with no moral objection. The pain caused to the victim in their bloody hands turns a tool that they use for their own business benefit to minimize the compensation and, at the same time, to silent it when the victim deserves an appropriate compensation for the huge pain that has been caused and for the society right to know the truth of what happened. The companies falsify the statistics. These agreements also include another abusive clause that says that the agreement would be cancelled immediately when a possible prohibition in the use of chrysotile may avoid them to continue its extraction. This is a way for the victims to become forced accomplices of their health debtors. The quantity of the compensation only reaches to cover the medical treatment expenses. This silence law is only possible under certain assumptions in the social, political and historical environment. If it is not like this, it would be impossible and this is why we can only find this situation where the conditions allow them to prosper. Taking into account the reasons that we have mentioned, in these cases the inclusions is carried out without the affected people authorisation, who have never been contacted. The knowledge of these situations has arrived indirectly through our informants who are linked to any of the existing victim’s associations. Their inclusion under false names (the possibilities of verifications are banned) distort the scientific method and reduce its credibility. However, we think it important to include (we leave it to the reader’s criteria) the probationary value that they have, taking into account their similarity with other well documented cases which we have mentioned previously (no matter what is their credibility), the general opinion about all types of asbestos toxicity would be the same. First case. The Pompeyo family contained three people: Marco Pompeyo, the father, Benito Pompeyo, the son and Rosa, the mother. Marco worked for ten years in the Italian factory of a multinational which produced asbestos-cement products. The asbestosis was the cause or his death. The mother, Rosa, also died from mesothelioma. Nowadays, the son, Benito Pompeyo, who worked for more time than his father in the same factory, is affected from pleural plaques. Second case. This time is the case of Antonio Minutti, who also worked in the same factory and whose wife, Flavia, died from lung fibrosis as well as Antonio. In his case, the occupational origin of the disease was recognised when he was diagnosed from asbestosis. An idiopathic ethiology (unknown or “spontaneous”) was attributed to Flavia’s affectation. However, as the autopsy was never done, it is thought that it was a case of household contamination by asbestos and there is no point in excluding it because, obviously, it happened and there are enough examples of the same final result. Regarding at their son, Simón, who worked in the same working centre as his father, although he is healthy, his secrecy and excuses about his own situation invite to all kind of speculation, among them we can find, obviously, the one that says that his silence is part of an extra-judicial agreement. When the generalized use of a carcinogenic toxic such as the asbestos makes an epidemic flourish years later, the improbable becomes probable: Mrs. Avril Grant, from Kent, England, lost her husband Chris Grant, who was an electrician who had worked with asbestos, using it as an isolator during his youth, died from mesothelioma; years later she started another relationship with Les Alford, who was a mechanic in Kent who had been exposed to asbestos of the strokes and other vehicles’ components in the 1970s and 1980s in his jobs as mechanic and lorry driver. Five years later she became a widow from his first husband, she also lost Les because of mesothelioma. Unfortunately, this is the future situation that awaits to citizens from countries whose governments do not accept to ban the use, extraction or importation of all types of asbestos, including chrysotile. Once we have checked all the multiple familial cases affectation, especially the one called “familial mesothelioma”, our reflections are: it is pretty obvious that when asbestos workers were hired, nobody informed them about the personal risk they were taking when doing this work. However, due to the long period of incubation of the process related to asbestos and its short term invisibility, one may conjecture that in case they have been appropriately informed and because of their need of subsistence, their economic poverty and the lack of an available job, it is possible that even though they were informed of this huge personal risk, they would have maintained their employment request. However, the question is: what if they would have been informed about the risk that their families, their children, their brothers and sisters, their wives, their nephews…were exposed to? What would have they done? What would have Mario Pavesi, Romana’s husband, done? Moreover, which right could they have done it with, exposing their families to such a risk? To clarify the context, our argument, which is contrary to the consanguinity hypothesis as a co-causal explicative element of familial mesothelioma, it must be taken into account that the several pathologies related to household asbestos exposition, including mesothelioma, can also be found in pets (dogs, cats, etc.). Is anybody going to claim consanguinity in these cases when the owner of these animals is been affected from mesothelioma to explain the clustering? Household asbestos contamination has been topic of a lot of scientific works. For example, see: Bianchi et al. (1987), Patel et al. (2008), etc. According to our opinion, “familial mesothelioma” is a cluster originated by the combination of occupational exposure in one or more of the members of a familial cluster, with household contamination or proximity contamination in an environment near the pollution origin by other members of the family. Therefore, this last type of contamination is more generalized in the clusters troubled with this tragedy. In certain cases, the contamination was produced when the victim was only a child. For instance, this is the case of Barry Welch, who died from mesothelioma on the 27th of April 2004 when he was 32. His stepfather, Roger Bugby, who worked installing scaffolds in the electric power plant of the Island of Grain, in the north of Kent, carried asbestos in his working clothes. Barry’s “accidental” death, according to the terminology used by the forensic surgeon, left three orphans. Household asbestos affectation comes determined by two access paths of the contaminant: thorough the cohabitation with a worker related to industrial activities where the mineral is present or the fact that the worker has had one of the several works where asbestos is frequently used, or though living nearby the dispersion focus: mine, factory, pier, shipyard, garage, etc. See: McNamara (2011), Hilbert et al. (2013), Christensen et al. (2013), Goswami et al. (2013). Moreover, there is a third path of household contamination, which we are going to deal with in extensor from now on, and it is the integration of materials and products which include asbestos in their composition in the house. They can be incorporated to structural parts of the house -for example, see: Pastuszka (2009)- or appearing in the composition of household tools, such as ironing boards which are covered with asbestos clothes. Here, we are going to deal with the lethal effects originated through the other two contamination paths, which were mentioned before. These situations have been widely treated in medical literature, which we will appreciate next. It is evident that in some cases, both contamination paths can happen in a certain house and in its habitants. However, we can observe a deficit of epidemiological studies referring to families who live with workers exposed to asbestos and referring to the risk of suffering lung cancer, larynx cancer, ovary cancer, etc. Is has been estimated that one third of mesotheliomas are produced in the EEUU may be caused by non-occupational asbestos exposure: Phakthongsuk (2011). A summary- Lieben & Pistawka (1967)- of 42 cases of mesothelioma which were reported by 153 hospitals in the southeast of Pennsylvania, showed that 21% of the cases occurred to people who lived or worked near a plant in which asbestos had been used, and 26% occurred there where some members of the family were asbestos workers. In Haber & Haber (2011), the authors support an inverse relationship between asbestos dose and latency. It is a hypothesis based on their own data, which seems to be reasonable. If it is so, and taking into account that low doses of contamination correspond to non-occupational exposure in general terms, the affected people would be in a more difficult situation when determining the etiology of their disease. Apart from the academic interest in this observation, it is evident that it also affects the victim’s reaction capacity and the probability of their judicial claims to prosper. Our register covers work from 1973 to our days. Therefore, the situation had been widely known since decades before the dates where the industrial use of asbestos was prohibited in certain countries, including Spain. Unfortunately, in other countries the use of asbestos is permitted because of a permissive or inexistent legislation which postulates a supposed “safe and controlled” use which prioritizes asbestos industrial private interests above the common benefit and the public health, above the respect and the life protection of the workers, of their relatives and the citizens who live near the production centres. This situation causes a truly industrial epidemic and an unpunished genocide. Among the several works in our bibliography which deal with the present effects of the use of asbestos in the past with affectation that reach people who did not acquired it in a working environment, we will highlight the article: Ndlovu et al. (2013). Among the articles that are included in our bibliography, several of them belong to works that treat about household contamination of pets whose owners either worked with asbestos or lived near a working centre in which asbestos was present. The inclusion of these articles is important as an evidence of the hypothesis of genetic predisposition in human can not be the principal or exclusive etiology to explain the existence of the “familial mesothelioma”. If among human this explanation does not make sense because there is no consanguinity, there is a bigger reason to be incompatible with the reality when this affectation reaches other spices. About the household asbestos exposition in the “ENCYCLOPAEDIA OF OCCUPATIONAL HEALTH AND SAFETY”, Margaret R. Becklake says: “In the past, household exposition came from washing the working clothes covered with dust at home; the dust which was left remained in the carpets and the furniture and was re-suspended in the air with the daily life activities. The levels of fibres in suspension in the air could not only reach values up to 10 fibres per millilitre (f/ml), in other words, ten times the limit of occupational exposure, 1f/ml, proposed in a WHO meeting (1989), but also the fibres tended to remain in the air during several days”. Regarding at the household contamination which is generated by a situation of cohabitation with one or more asbestos workers, it has been guesses that this contamination has been produced because of the washing of the working clothes in the worker’s house. This way of expressing it has created some confusion when supposing that it is the washing that determined this household contamination. However, the crucial factor is bringing these polluted clothes to home, although it is true that the washing increases the risk. On the other hand, it not clear enough if without washing the clothes at home, the invisible fibres which are carried on the hair, the shoes or the lunch box, are enough to originate the same effect taking into account that, as it has been demonstrated, very low levels of pollution could be enough to originate mesothelioma. Obviously, this is not an obstacle for the washing of the clothes to increase the risk. In relation with these exposed observations we have that in Oomen & Lijzen (2004), the authors highlight the important role of soil contamination, for lead and for asbestos, in the affectation originated in the house; a circumstance that is specially outlined when the children are who suffer from it. Using the ILO 1980 standard criteria, in Kilburn et al. (1986), the authors found radiographic signs of asbestosis in 11% of the wives and 2% in the daughters of shipyards workers in Los Angeles (California). These percentages were obtained after excluding those with any occupational exposure to asbestos. In a certain moment, Maryland supreme court determined that asbestos companies are not responsible of the pathologies which are suffered by their worker’s relative’s diseases as a consequence of bringing the carcinogenic fibres with them to their houses. Moreover, it ruled that the company “Georgia-Pacific” was not obliged to warn these working relatives from the dangers of asbestos in the 1960s because they were not widely known until federal regulations were emitted in 1972. The court’s decision annulled a compensation verdict with five million dollars to a woman who was diagnosed from a malignant tumour because of her exposition to asbestos washing her grandfather’s clothes. This is not the first time that a justice court links the recognition of a risk with the date in which it was reflected in the legislation. However, this type of conclusions avoids certain considerations whose truthfulness is well-known and modify drastically the lack of a reasonable basis that these conclusions of exoneration can have, according to the aspect that we will deal with next. Firstly, it is not taken into consideration the evident existing temporal mismatch between the scientific evidence consolidation which were reached about this risk and its reflex in the correspondent legislation. It is even more important the fact, which has been contrasted during all the period where asbestos was industrially used, that this temporal mismatch has happened in a principal or an exclusive way to the action of the lobby of the same asbestos companies and has been supported by the publication of illegitimate so called “scientific” works, which were paid by these companies. They have to assume their collective responsibility taking into account the large amount of publicity that the companies used in the market. Moreover, there is a contrasted evidence that these studies were asked and financed by the same companies, which clustered together for it. Let’s add to all of this the fact that, as it has been proved in several occasions, the same companies which tried to hide intentionally the evidence which arose in their own business actuation environment by participating in private compensation agreements which obliged the victims to do not sue or make public their situation and at the same time, hiding the statistic results which are derivable from their own registers; keeping the medical expedients obtained hidden and do not informing their employees about the truly etiology of their disease and not informing the health authorities nor the consumer of their products. Therefore, we must conclude that the Maryland court’s verdict has been an injustice that goes beyond the facts concerning the own victim. This is an inadmissible and scandalous fact that should not be repeated in future similar cases. We can consider it an attack to a social class: the workers. An attack perpetrated through an economic and socio-political system that allows it. We have already indicated that all the aspects mentioned before does not diminish importance to the clothes washing in the familial house as a household contamination source, but there is also the opposite situation: when the washing up at home is substituted by an industrial washing and it substitutes a distributed and minor risk by a concentrated (so, potenciated) risk which is focalised in one group of workers; the ones that substitute the housewives who did this task at home. Moreover, the rest of the family members are also taken from the risk. Frequently, the companies outsource these washing up services to specialized establishments in risky industrial laundry where asbestos is one out of a lot of contaminants among others (hospital laundry, chemist laundry, pesticide laundry, etc.). under these working conditions, it is practically impossible to make the workers aware of all the risks associated to a specific contaminant, including asbestos, because if this situation arrived, they would have to ask for the settlement and look for a less risky job. On the contrary, the aspect that the workers are aware of is that this is their “ecological niche” in the job market. In addition, in this situation, we can say that the synergic effect between the several contaminants is “generalised”, the same happens with the marginal ghettos inhabitants of the shacks who work in the uncontrolled dismantle of all type of industrial and urban residues. The same happens with scrapyard’s workers, who dismantle electrical appliances and motorized vehicles. About the enhancer effect, in the concrete case of mesothelioma, of several contaminants including asbestos, see: Lacourt et al. (2013), Innocenzi et al. (2013). If the medical bibliography provides household contamination evidences, because of living with an asbestos worker or the localization in the house near some source of industrial contamination, such as piers, mines, factories garages, etc., where asbestos has been present, the other available resource to access to knowledge of some of the registered cases is provided by the review of judicial cases which correspond to any of the two contamination paths. We have already had knowledge of some of them such as the example of Mr. Margereson. Since the 20s, asbestos industry had had knowledge of the lethal effects of asbestos: Pickering (2000). In a story of the facts, which is data and information coming from the mentioned source debtor, we can report our view about them, which we will develop next. Mr. Pickering, who is a prestigious lawyer and has a brilliant professional career connected with disputes for asbestos, which includes Alice Jefferson’s defence of compensation rights for mesothelioma affectation. She is the main character in the famous documentary «Alice-A Fight for Life», made a speech in Osasco’s Conference in 2000, whose text corresponded to our previous bibliographic citation. In this speech, he reported the case of Arthur Margereson, who had worked among asbestos dust sacks outside the factory which the company «JW Roberts Ltd» had in a suburb of Leeds, West Yorkshire, England, from the group “Turner & Newall”, and had been left there by the mentioned company between 1933 and 1939. The houses were in the neighbourhood of the factory. In 1933, Mr. Margereson was eight years old. He developed mesothelioma in 1990 and died from it in 1991. The judicial cause of this death was celebrated in 1995. In its defence, the company alleged that neither in the 30s nor in the 40s nor in the 50s the fact that mesothelioma was originated by asbestos was not known, but the judge sentenced it to pay fifty thousand pounds by claiming that the company should have known that the children who played with the asbestos dust outside the factory, in the loading docks, can be affected from this asbestos dust because there was so many visible dust outside that even if it had been inside it, it would have been illegal according to the English legislation which was current in 1933. “Turner & Nevall” fought for the case for more than four years before the trial arrived and then, it did it for one more year in an appeal. An important part of the case was the rule that all the relevant documents must be known and be laid on the table, so they can be seen by both parts. “Turner & Nevall” lawyer swore that he did not have these documents any more. Fortunately, in the United States, the lawyers who managed the complaints’ report originated by asbestos which was projected against building’s surfaces, discovered that thousands of documents existed which may be relevant for Mr. Margereson’s case. It was asked to the judge to order these documents to be shown, but after listeting to the company’s lawyer’s plea, he said that it was too early and he would not give this order until the case had been suitably investigated. In 1992, it was asked again and this time he agreed. Then, the company appealed to the Appeal Court. Fourteen months later, the appeal was dealt with. The day of the hearing, but before it was celebrated, the company admitted that they had the documents and they were ready to show them to the plaintiff part and promise to do it in two months. They did not keep their promise. Instead of showing the “old documents”, they gave an useless rubbish without value. A third judge ordered them to show the documents. However, they were not revealed. In 1994, a fourth judge ordered that the trial should start in 1995 and gave them a last period of some months to show the documents, but they did not do it. Only one month before the trial, they did the official delivery in Mr. Pickering’s lawyer office by unloading a lorry with 27,000 pages of relevant material. It was too late to read it. But the cases that were happening in the United States were covered by a different rule. In New York, a judge had ordered “Turner & Newall” to let the American lawayers to visit their facilities and read the documents. The American lawyers travelled to Manchester, in England and took a lot of documents to be copied. They flew to New York and after they brought to Mr. Pickering’s lawyer office in Manchester a group of photocopies, so the important documents for Mr. Margereson’s case could be identified two years before the trial. In the 1940s, they were also conscious of the fact that people who worked near asbestos sprayers took risk of injures and in the same decade they knew that asbestos can cause cancer. They have a lot of workers who have developed asbestosis and since the 1920s, thee knew that this disease may cause the death. One of their directors, Mr. Waddell had been a Factory Inspector hired by the English government to take care of their employees. In 1958, he already knew that blue asbestos is especially dangerous after talking to a South African doctor who had discovered the relationship between asbestos and mesothelioma. However, he said that blue asbestos was a too big object of an active market to get rid of it and the company should fight for asbestos until the last minute. He said so when Barbara Birchall, who was another mesothelioma victim, was working for the company in the 1960s. However, Armley’s factory had been closed in 1958. The company lost the case again in the Appeal Court in 1996 and Mr. Margereson’s widow received the poor compensation of fifty thousand pounds. The Appeal Court highlighted the fact that before 1933 there was a lot of medical bibliography which gave evidence that asbestos dust was damaging. With this argument, it dismissed the defendant company’s appeal when it appealed to the fact that asbestos and mesothelioma was not known until many years later the contaminant exposition. According to Mr Pickering’s lawyer, the conclusions that should be deduced are two: the first one is that an asbestos company will reach any extreme to oppose to the compensation complaints. The judge said that “Turner & Newall” had used all the legal and illegal methods during their resistance to the complaint. The second one is that we can not trust in these people who are designated by the State to take care of the workers’ health. When Mr. Weddell knew that asbestos dust may cause asbestosis, lung cancer and the incurable mesothelioma, he estimated the economic benefits to be too big to justify the reduction spending money on protecting the workers. We would like to highlight two aspects. The first one is the attention that deserves that fact that the asbestos industry knew about its lethal dangers very early; and the second one is the fact that due to the worldwide publicity that the asbestos industry organised around the world, creating oligopoly situations, which have reached our days and at the same time the knowledge and the hiding of the terrible asbestos properties, all the industry is affected and especially the ones that had certain links with “Turner & Newall”. The case of Mr. Margereson, which was individual, could be checked after a research work of the «Yorkshire Evening Post» newspaper, that was a generalised disaster which reached a wide part of Armley, where the cases of mesothelioma mixed in a complicated net of contamination paths, between occupational exposure and the one related to the neighbourhood. In 1992, a company spokesperson said: “Turner and Newall have not had knowledge of any evidence which links asbestos with the old factory of JW Roberts”. However, the times where a simple testimony done with huge brazenness to muddle was enough, had been over for a long time. In effect, in 1987 the “Chase Manhattan Bank” started a legal process against “Turner & Newall” in the United Stated claiming for compensatory damage because of the danger which was created in the “Chase” corporative headquarters because of the presence of asbestos spray, which was applied to make the building materials fire-resistant. Because of the trial, around two million documents of “Turner & Newall”, which have not been seen previously by the lawyers neither by the British historians, were discovered during the process. The vice president of the bank, Mr. Michael O’Connor, recognised the value of the documents, which went back to the 1920s and, as there was no protection order which would have prohibited them to be divulgated to other people, he started to send large quantities of boxes with copies of the key documents of “Turner & Newall” to the media, to the lawyers, to the doctors, to the victim’s group of help and to historians. In 1995, O’Connor was awarded with The Prize of Press Freedom in the United Kingdom. This heritage documents permitted some claims to prosper. Some of them referred to cases of household contamination, neighbourhood contamination or living contamination. These documents left out of no doubt that “Turner & Newall” (all the reputation of asbestos) had had complete knowledge of all the wickedness of asbestos, including cancers and hiding the people from this knowledge since the first decades of the 20th century. Our last evaluation should be considered as an industrial catastrophe situation which undoubtedly must be qualified as a first magnitude public health problem where we will fins situations such as contamination and the consequence of the lethal mesothelioma, pets and we will also find situations in which a member of a profession which is apparently far away from asbestos such as hairdressers has been reached by mesothelioma because during his working life has had as clients, industry asbestos workers who went to his settlement wearing their working clothes: Rigby (2004), Dahlgren & Talbott (2015). In a review, -Donovan et al. (2012)- where we can find Denis Paustenbach as an author, reach some conclusions related to the cases of mesothelioma because of household contamination, which we will comment next. Going back to our analysis of Donovan et al. (2012) work, we have to say that it is important to take into account that in their revision, these authors just consider the scientific bibliography, so they leave all the cases that are known the same through judicial disputes where the causal link between the household exposition and the mesothelioma has been admitted. Nobody is hidden the fact that the causes that are covered by medical literature represent only a minority, according to the total number of cases. Secondly, they indicate that 98% of the available lung samples of the persons with diseases indicated the presence of amphibole. Maybe the authors are indicating the truly etiology referred to them and not to chrysotile. This aspect should be considered definitely resolved since the moment when the fact that mesothelioma also appears in front of contaminations of pure chrysotile without amphibole and at the same time, a large number of asbestos workers have been exposed to serpentine and also to amphiboles could be confirmed. Moreover, most of the chrysotile are contaminated with amphiboles naturally, no matter the place of extraction. If the authors conclude: “The available data do not implicate chrysotile as a significant cause of disease for household contacts.”, it is evident that the guess we have mention before was correct and we have showed the limitations and incongruences. This is why, we do not find their conclusion justifying which, on the other hand, it is not surprising if we take into account previous uprising from at least one of the authors, Denis Pausetenback, whose consultant’s company has traditionally been linked by contacts to the chrysotile industry, from the mine to the product elaboration based on this mineral, as it is the case of strokes and clutches fabrication and its main client: the car industry. Adgate et al. (2011), Al-Ghimlas & Hoffstein (2007), Anderson et al. (1974), (1976) & (1979), Bianchi et al. (1981), (1987), (1991), (1993), (1997) & (1999), Booth & Weaver (1986), Bourdès et al. (2000), Browne & Goffe (1984), Candura et al. (2008), Chellini et al. (1992), Dodoli et al. (1992), Doniach et al. (1975), Driece et al. (2010), Epler et al. (1980), Ferrante et al. (2007), Fischbein et al. (1980), Fischbein & Rohl (1984), Gardner & Saracci (1989), Giarelli et al. (1992), Glickman et al. (1983), Goldberg & Luce (2005) & (2009), Hammond et al. (1979), Howel & Arblaster (2000), Howel et al. (1997), Huncharek et al. (1989), Inase et al. (1991), Kelly et al. (2006), Kannerstein et al. (1977), Kilburn et al. (1985), Kishimoto et al. (2010), Kumagai & Kurumatani (2007) & (2009), Kumagai et al. (2010), Kurumatani & Kumagai (2008) & (2011), Kurumatani & Tomioka (2009), Langer & Nolan (1989), Magnani et al. (1991), (1993 -2 ref.-), (1995), (1997), (2000) & (2001), Maltoni et al. (1990) & (1995), Mangone et al. (2002), Marchevsky et al. (2006), Marier et al. (2007), Marinaccio et al. (2006) & (2015), Maule et al. (2007), McDonald & McDonald (1973), Metintas et al. (2002), (2005), (2008) & (2012), Miller (2005), Mirabelli et al. (2010), Misdorp (1997), Mise et al. (2009), Mollo & Magnani (1995), Morinaga et al. (1989), Mowé & Gylseth (1984), Muscat & Wynder (1991), Musti et al. (2002) & (2009), Newhouse & Thompson (1965) & (1993), Nurminen (1975), Orenstein & Schenker (2000), Park et al. (2008), Patel et al. (2008), Peipins et al. (2003), Peretz et al. (2008), Proietti et al. (2004) & (2006), Rake et al. (2009), Reid et al. (2007), (2008 -2 ref.-) & (2013), Rom et al. (2001), Ruers (2004), Saba et al. (2013), Schipperijn (2007), Schneider et al. (1995), (1996 -3 refs.-), (2001) & (2014), Schneider & Woitowitz (1995), Selikoff (1981), Selikoff & Hammond (1968), Selikoff et al. (1972), Sheers & Coles (1980). Shtol’ et al. (2000), Sinninghe et al. (2007), Vianna & Polan (1978), Vudrag et al. (2010), Wagner et al. (1960), Whitehouse et al. (2008), Woitowitz et al. (1984).